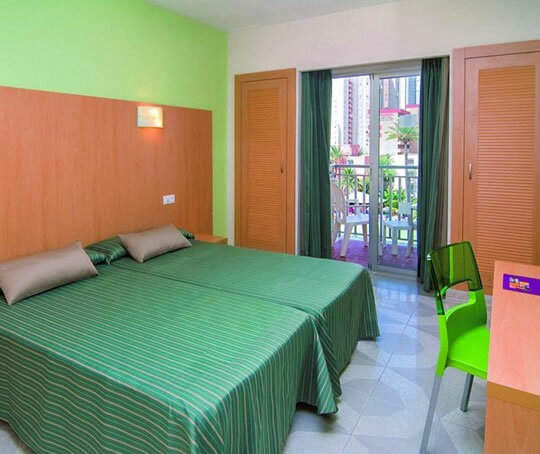 The highly regarded 3 star Hotel Servigroup Pueblo Benidorm is located in a lively area of Benidorm, just 300 metres from the sandy Levante Beach and a short stroll from the lively resort centre where you can explore the shops, bars, restaurants and night-life. Guests can be accommodated in either the central building or one of the five smaller blocks located around the sun terrace, the swimming pools and tropical gardens. Transfers take around 45 minutes to make the 35 mile journey from Alicante airport. The Servigroup Pueblo has 539 guest rooms all well equipped with: Twin beds and extra beds for room for up to 4 (max 3 adults or 2 adults/2 children) and consists of bathroom and wc, flat screen TV with the latest digital system with 60 national/international channels plus 15 music channels, safe deposit box (supplement), air conditioning (high season) and heating. All rooms have a balcony/terrace. There is also complimentary WiFi connection in the room. The hotel provides half Board accommodation with an option for Full Board. 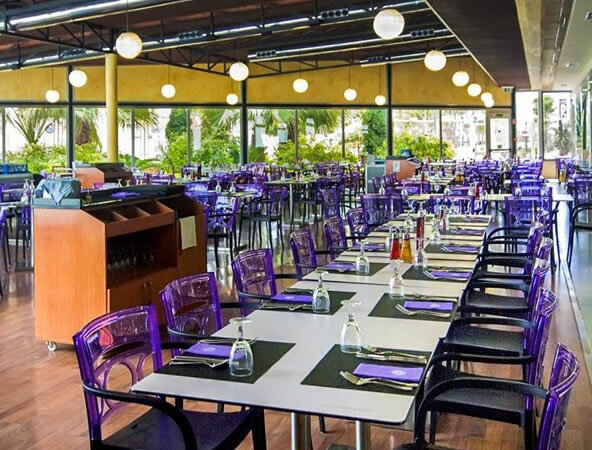 The award winning main restaurant offers buffet style breakfast, lunch and dinner with 'show cooking' where meals are cooked in front of you, all prepared with the freshest of ingredients on the varied menu. The restaurant in the hotel also has vegetarian choices and a gluten free menu for Celiacs. You can enjoy a cool drink or a cocktail or two at one of the hotels bars; Mediterranean Café, Lounge-bar “Atlantic” or the pool bar. 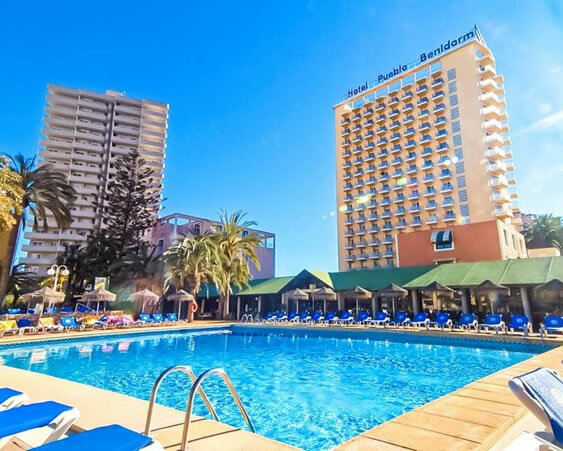 The Pueblo Benidorm is great fun for all the family there is a arge sun terrace with two swimming pools for adults and one for children (electrolysis disinfection) and an indoor heated swimming pool. Other amenities include ping pong, pool table, shuffleboard, petanque and computers with internet access (supplement). 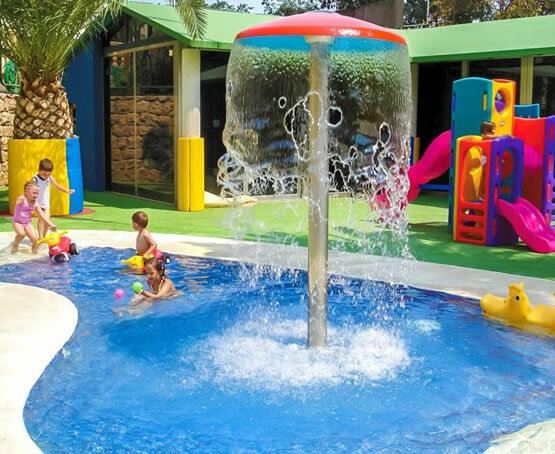 Kids will love the children’s playground provided with slides, toys and swimming pool. The Mini-club Delfi (high season) has its own mascot, workshops and activities designed just for kids. Children under 4 years must be accompanied by an adult. There is a wide range of activities and an entertainment programmes for children and adults, including shows and live music. The hotel has a 24 hour reception. 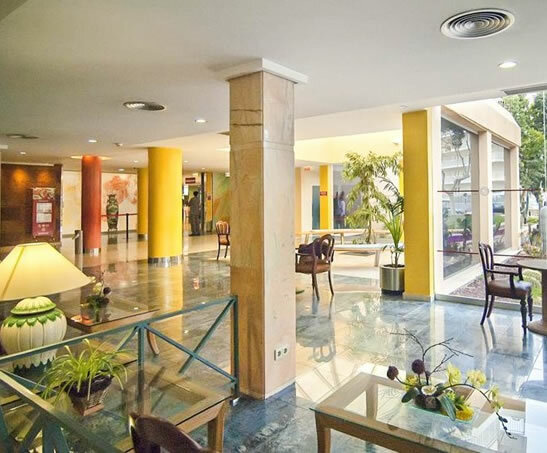 There is free Wi-fi throughout the hotel including outdoor areas, a hairdresser at Servigroup Venus hotel (supplement), Servigroup shop/boutique with souvenirs, gifts and accessories. Computer with Internet connection at the reception area (supplement). The hotel also has a panoramic lift and 91 hotel-owned covered parking spaces (supplement). It is also possible to exchange currency and rent a car (you can always pre-book your car rental before departure please ask us for a quote!). For excursion ideas and things to do click Benidorm to see more information.